What a perfect way to start spring! 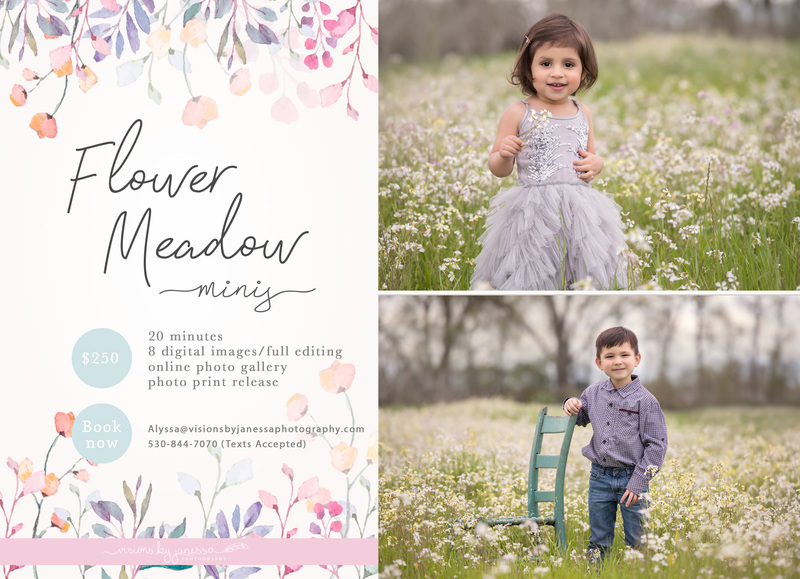 These sessions are designed for quick family shots, photos of your children, expectant mothers, babies who are sitting up, seniors, couples and beyond. We are pet friendly and encourage you to include your pets! We will provide a limited amount of props. All you need to do is come dressed for your session! Sessions will take place the Biggs/Gridley area. Sessions are by appointment only. Sessions will book from 9 am-6 pm on both days. ADDITIONAL DIGITAL IMAGES ARE $25.00 PER ADDITIONAL IMAGE. Please see print pricing for cost of additional prints. We will do our best to fit you in on your desired session date and time. Once your information has been sent, you will be sent a contract & invoice that must be completed to keep your session time. If your contract is not completed within 12 hours, you will forfiet your session to another client. Refunds will not be given for cancellations under any circumstances. Studio credit will be applied towards your account if a cancellation is to occur. Turn around time is 1 week for all digital files. You can request a rush on your order. Please ask about our rush options if needed. We look forward to hearing from you & working with you!! !